Males have a narrow tail flap, while females are wide. 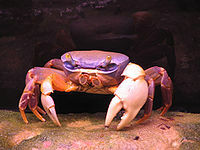 This is a territorial Crab which is best in species tank, one to a tank, although a male/female pair may work provided the tank is large enough. It will attempt to eat fish. They are true scavengers and opportunistic predators. They will eat whatever they can find (dead or alive) but will never miss an opportunity to eat a smaller crab, freshly moulted crab or crayfish and generally anything that can be caught and held onto long enough to eat. The general behavioural patterns of this crab are similar to most others in the aquarium environment but due to sheer size they are prone to eat smaller crabs, crayfish, smaller fish and generally anything they can find. They do well to have at least one perch above water per crab (or a larger shared one) where they will carry food off to eat often. These crabs should be treated as an aggressive pet. This page was last edited on 6 April 2017, at 21:42.